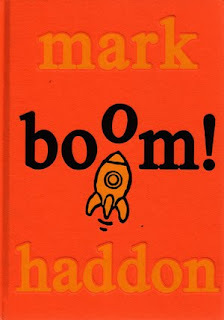 Today I shall shortly tell you about one of my favourite book writers: Mark Haddon. Yeah, the one of "The Curious Incident of the Dog in the Night-Time". 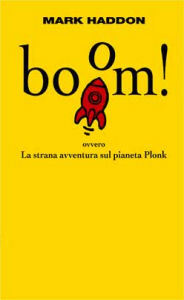 Though I shall not talk about that book, instead I will tell you about BOOM! I know, I'm late: in fact the book came out at the end of 2009! Well, to be precise it was first published in 1992, as this is the revised edition of Gridzbi Spudvetch! that was published at the times by Walker Books Ltd.
Mark Haddon, if ever needed, reconfirms his talents: he's incredibly versatile and ironic, he can easily play with words and - in this specific case - he even invents a new language and surreal sceneries that take us to other dimensions. The book is really nice, well built, the main character well outlined. It's as well a text that is suitable for more than one reading key, it's therefore right for different ages... as well for those adults that have no prejudice regarding kids lit! I'll have to look for this one. Wonder if it's been published in the States yet? Hi Jules! I think it has been... by Kindle Editions if I'm not wrong! The Quiet Book & The Loud Book!